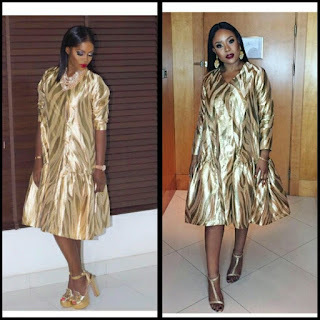 CHECHESMITHNATION : Who Nailed This Look: Between Mimi Onalaja And Singer Tiwa Savage! Who Nailed This Look: Between Mimi Onalaja And Singer Tiwa Savage! Media girl Mimi Onalaja right, and Singer Tiwa Savage both rocked this look respectively. This metallic look, is from the Lanre Dasilva Ajayi's ss17 collection named "Shoshana" dress.